iPad for Dummies question (only because I don't regularly use one). How do I get a published course (I presume publish for Web) from my Windows laptop on to an iPad to play in the Articulate Player? Are there any step-by-step instructions somewhere? Google didn't help me, only with publish settings in Storyline. Once it is published, what now? Once your content is published and uploaded to some webserver, open the URL in your iPad's browser. That will redirect you to the player app. You may have seen this already, but here is some info for using the player app to view content on iPad. Unfortunately I am an iPad beginner, so for something that might be simple on an Android tablet as copy-and-paste the file over has taken me 3 hours to get this file unzipped in the Documents app. When I launch with story.html it doesn't open in the Articulate Player, and when I go to the Player it doesn't recognise that the course is on the iPad. I tried a Youtube search - might be easier if I can 'follow the bouncing ball' and see what they are doing - but alas, couldn't find anything. Maybe I need to send a Review link with comments turned off. Gets messy with sending emails, and having people log in to their emails but I honestly can't figure this out. Email that URL to yourself. From your iPad, download the Articulate Mobile Player app. 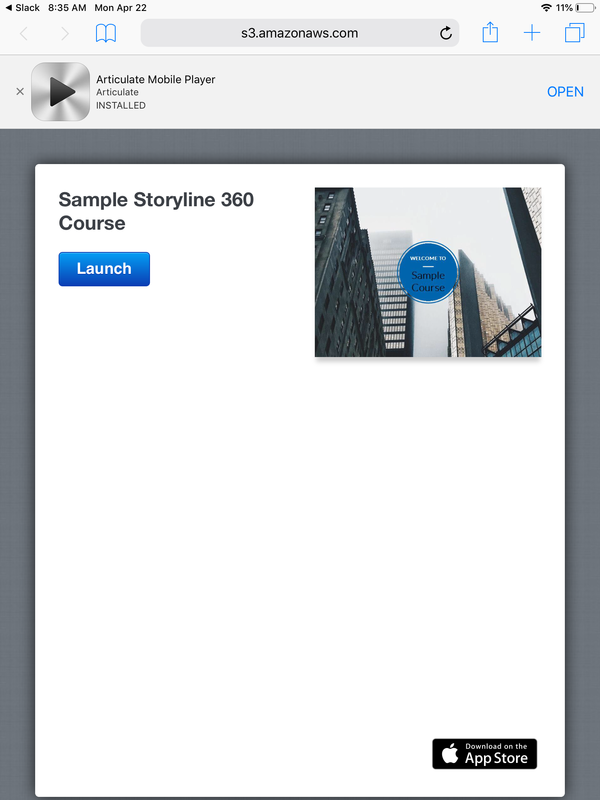 After the app is installed, open your email from your iPad, and find the email with the course URL. Click on the URL to your published course. Clicking the URL should automatically prompt the Articulate Mobile Player app to open. I haven't touched this a while - had to walk away and give it space! I uploaded the zip file, so on the iPad it wants to download the zip file and then I can save it in the documents folder, but then this doesn't work as it just shows as individual images. I can also save it to the Documents app and in here when I click on the file it unzips it all in to a folder. In this folder, I click on and I get stuck - I click on the story file and it will open the Articulate app automatically - so I thought I was on to a winner here - but no. I receive a pop-up error in the Articulate app that says: "Cannot Download Content - Articulate Mobile Player cannot download the content because one or more files cannot be found". 4 hours spent today and at the final hurdle - and stumbled. All files are in the folder together, but I can't seem to figure it out. I tried Youtube to see if there was a video to watch. Step by step instructions are good, but not being iPad expert it is easier to watch. I couldn't find anything though. Check out this video I recorded for you. It's a step-by-step process for publishing a file, hosting the output on Amazon Web Services, and opening the file on an iPad using the Articulate Mobile Player. Here's the link to the file I published in the video. Please open that link on your iPad, and let me know if it opens in the Articulate Mobile Player. This is what you should see when you open that link on your iPad. Would you believe that after all that, the issue was that I was zipping the Storyline file before putting it in to Amazon. "Hey Michael! Check out this video I recorded for you. It's a step-..."